This is a plan ahead recipe that requires soaking grains overnight and is a great one to play around with flavour combinations – substitute chia for flax or cranberries for dates to suit your taste and whatever you’ve got going in your kitchen cupboard. 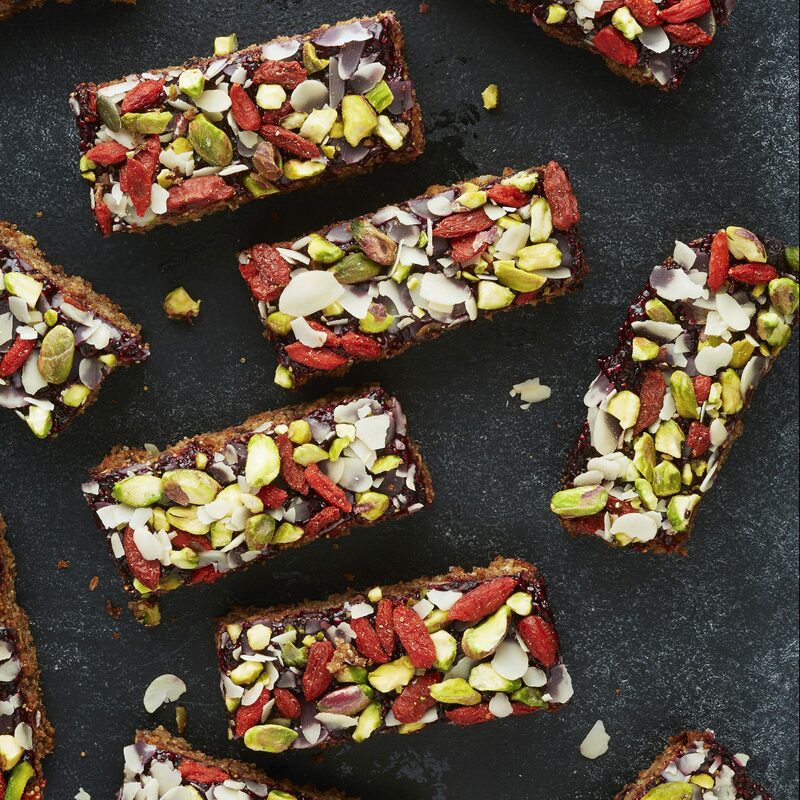 Amaranth is a really cool grain that’s just as high in protein as quinoa and adds a little extra crunch to these muesli-esque bars. Preheat the oven to 180°C (160°C fan/350°F/Gas 4). Line a shallow 30 x 20cm (12 x 7¾”) baking tray with non-stick baking parchment. Put the amaranth in a processor with the oats, raisins, cranberries, seeds, and cinnamon. Whizz briefly to combine. Melt the coconut oil and maple syrup in a small pan over a medium heat. Stir in the nut butter (or tahini) and mashed banana. Spread with chia jam, then sprinkle with goji berries and nuts, pressing them in so they stick. Leave to cool completely before cutting into bars. Store in an airtight container in the fridge for up to 1 week. They also freeze really well for around 3 months. This and loads of other tasty recipes are in our cookbook ‘Superfood Breakfasts’. Available in bookshops, on Amazon and on the DK website. Published by DK in May 2016 with gorgeous photos by Will Heap Photography.